Amanda Pettit is a devoted enthusiast of hot beverages, classic literature, and close friends. She divides her time between her family, her writing, and the management of Sanctuary Home For Children, which has taken her to India and back and given her an ongoing mission to improve the lives of street orphans. When she's not busy with the big stuff, she also enjoys sewing, video games, football, and shopping. 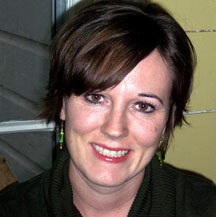 Amanda lives in Texas with her husband Ray and their children Virginia and Edward. Visit her blog at http://thislittlepig73.wordpress.com/. WOW: Congratulations on placing as one of the Runners Up in our Summer 2009 writing contest! How do you feel? Amanda: Thanks! I feel fabulous. This is actually the first contest I've entered since I embarked in earnest on my writing adventure. Earning a spot in the top ten on my first attempt has been a wonderful morale boost, and I so enjoyed receiving the prize package in the mail. WOW: That’s great. Can you tell us what encouraged the idea behind your story, Coffee Date? Amanda: I am fascinated by family dynamics, particularly the relationships between sisters. I have two sisters myself, and there is a wealth of interesting material, both positive and negative, when I look back on our decades together. Each sister has made unique choices about parenting, marriage, career, and a million other things, and I think those differences and similarities are worth exploring. While my own sisters and I are younger than the characters in Coffee Date, we have definitely had profound differences and reconciliations. We have changed our opinions of each other over time. I like the way people—both in fiction and in real life—can have disagreements but choose to respect each other, even if it's a long process. And the setting, a coffee shop, is one I find popping up repeatedly in much of what I write, probably because I enjoy a weekly coffee date myself with a close circle of girlfriends. A coffee shop is the ideal neutral ground for relaxing, sharing, talking things out. Amanda: I write three full days a week, while my children are at school. When I write, I need a big chunk of time in order to really get going, and I don't like interruptions. A full day (about seven hours for me) is perfect. By the end of the third day, my wrists and elbows ache, but I'm very happy and wishing there was some way to skip the housework days and the weekend to get back to the writing days again more quickly. I need a clean room, silence, something hot to drink (more on that later), my laptop, and whatever notes or books I have to refer to. I try to write something smaller, like a flash fiction piece or poetry, at least once a week, and most of the remainder of the time is spent on novel writing. I blog, too, but it's easy for me to lose half a day on blogs, both my own and reading/commenting on others, so I try not to spend my real writing time in the blog world, tempting as it is. Amanda: My top goal for 2010 is finding an agent to represent one of my novels. I currently have two novels written but not completely polished, so getting them both through the final stage is high on my list of writing tasks right now. The first, Scribe, is an adventure set in modern day San Antonio, ancient Egypt, and the mythical Egyptian world of the dead. My educational background is in anthropology, so I have a strong interest in other cultures, archaeology, history, and love to put those elements into a story. The second novel, The Great Uneven, is about an older woman with OCD, and I completed most of it during NaNoWriMo. It has been really fun getting those two major projects on paper and I look forward to getting them really polished—even though I'm tempted to set them aside and start on the next book. WOW: Your books sound interesting, and we wish you the best of luck with your goals. How did Sanctuary Home For Children come about? How can people help? Amanda: Sanctuary Home was started about three years ago when my close friends in India asked us to help them start an orphanage. At first, I absolutely thought the idea was ridiculous - who was I to take on a task like that? What did I know? I'm a Christian, and my connection with the Indian family was ultimately because of church stuff, so I prayed about it. Honestly, what I prayed was that God would show me how crazy it was, and close doors, confirming that it was impossible. I was mortified at the thought of asking people for money. My husband was a graduate student, we were broke, and even living in my parents' basement. We were definitely not the right people for the job. As you've probably guessed, though, it didn't turn out the way I wanted, and instead of an impossible task, one good thing led to another, and three years later I am somehow directing a 510(c)(3) nonprofit with a network of child sponsors in the US and over ninety former street children are being fed and educated and loved. It's been an humbling and joyful experience, from the first day I realized people did want to help, to the beautiful meeting with so many sweet little faces on my first visit to India, to the continuing support and ongoing communication with the directors in India, who amazed me by opening their home to so many in need. It's a lot of work, but completely worth it. Our website, www.sanctuaryhome.org, has information on how to help, and there is a recent article on halogentv.com about us. Thanks for asking. WOW: On a lighter note, you mention that you’re a “devoted enthusiast of hot beverages.” Describe your top three favorites. Amanda: My absolute favorite, or at least the hot beverage I consume in the largest quantities, is French Vanilla black tea by Bigelow, served pretty close to boiling, with a bit of milk and sugar. If I'm out and have a little money to spare, I go for a chai tea latte with soy milk from a coffee shop. Among many other wonderful hot drinks of all sorts, another standout is a traditional hot toddy. It isn't something I drink on a daily basis, best saved for the times I'm under the weather, or have a headache, or just can't seem to get warm. My favorite hot toddy recipe: 1.5 ounces of brandy, 3 tablespoons lemon juice, 2 tablespoons honey, a cinnamon stick and a few whole cloves, and the mug topped off with hot water. Of course, I always nuke it for an extra thirty seconds, because as with all hot drinks, the hotter the better. WOW: Now I’m ready for a nice, warm drink! Those all sound delicious. Do you have any final words of wisdom for our women readers/writers? Amanda: Do it. After waiting a lot of years for the stars of circumstance to align perfectly, I finally started writing like I meant it. The wait, for me, was about twenty-five years, which I calculate based on the fact that I recorded in a journal at age eight my intention to write a book. I have never been happier than I am now, since I finally took the plunge. If you have a dream that's hanging on somewhere in the back of your mind, something that keeps resurfacing, some aspiration that keeps knocking at your door, let it in. Don't put it off any longer. Do it. Amanda, I really enjoyed your story, "Coffee Date" and your books definitely sound like ones I'd like to read.